For more than two decades a nurse in coronary care units and psychiatric hospitals, Theodore Deppe has also been an influential teacher of writing. His poems are genuinely and precisely dramatic as they embrace complicated human relationships in flux, with “compact lyrical narratives” (Eamon Grennan) that embody remarkable people in encounters with each other and their landscapes. know, and can’t name it. We don’t live on this island now. as do gnarled pines in T’ang Dynasty paintings. I know I’m home when I reach this crooked rowan. but one hobbled tree. From which a girl might step. 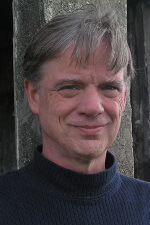 Ted Deppe was born in Minnesota, and grew up in Indiana. He worked for many years as a coronary-care and psychiatric nurse and has taught creative writing in high schools, universities, and graduate programs in the United States, England, and Ireland. His previous books include Children of the Air and The Wanderer King (Alice James, 1990 and 1996), and Cape Clear: New and Selected Poems (Salmon, 2003). He currently teaches in the Stonecoast M.F.A. Program and directs Stonecoast in Ireland, where he now lives with his wife, poet Annie Deppe.